All biochemical activities accompany with energy exchange . Fabulously, the oxygen consumption per tissue weight in the retina is one of the highest in the human body. Therefore, retinal tissue is heavily dependent on mitochondria for energy supplement. Retinal ganglion cells (RGCs) have been estimated to have more mitochondria than any other neurons in the central nervous system (CNS). Mitochondria concentrate on regions of high energy consumption. Retinal ganglion cell axons are unmyelinated within the ocular globe, and there are many varicosities, which are rich in mitochondria in that region. The mitochondria-enriched axon varicosities with local high-energy concentration are particularly relevant for maintaining normal signal transmission. In the myelinated regions of the ganglion cell axons outside the globe, the number of mitochondria is much fewer except in the nodes of Ranvier where energy is needed for the continuous propagation of action potentials. Thus there is an asymmetrical distribution of mitochondria along the ganglion cell axons, with the unmyelinated regions within the globe (highly energy demanding) containing an enriched population of mitochondria and the myelinated regions behind the laminar cribrosa (less energy demanding) having less mitochondria. The number of mitochondria in each ganglion cell axon also varies depending on the ganglion cell axon lengths, which is determined by the localization of their somata in relation to the optic nerve head [2, 3] (Fig. 23.1). Cytochrome c oxidase in one of the oldest enzymes known, and it accounts for more than 90% of oxygen consumption by living organisms. An increase in cytochrome c oxidase expression reflects vibrant mitochondrial activity, while a decrease in cytochrome c oxidase expression is represented as a mark of neurodegeneration. Histochemical staining shows that mitochondrial enzymes are predominantly located in the non-myelinated axons in the retina and optic nerve head and have a less expression in the optic nerve. Presumably, an alteration in the functional status of mitochondria will influence nerve axon survival in a disease like glaucoma. As the intracellular diffusion of ATP is restricted, changes in regional energy demands mainly depend on mitochondrial motility. Mitochondria move toward regions of high energy requirements and away from regions of low energy requirements. Mitochondria are transported bidirectionally by the anterograde and retrograde axonal transport. The long-distance movement along microtubules (MTs) is supported by kinesin motor proteins, for anterograde transport, and by dynein motor proteins for retrograde transport. Translocation along actin filaments is assumable driven by myosin V. However, the proteins that mediate mitochondria docking remain unknown. Mitochondria vary in shape and size caused by fission and fusion event, which usually retains a dynamic balance. Interruption of mitochondrial fission activity will lead to the formation of large elongated organelles caused by ongoing fusion events, while breaking of the fusion activity will result in the generation of multiple small organelles. Large dynamin-related GTPases and proteins such as Opa1 are the core element for mitochondrial network maintenance, so the abnormal expression of those proteins can lead to excessive fission and cell death. An abnormal accumulation of proteins in the optic nerve head is the earliest indication of RGC damage. Axonal transport refers to the process whereby vesicles are transported along microtubules by the dynein and kinesin motor proteins. The dynein and kinesin motor proteins gain energy by hydrolyzing ATP (adenosine triphosphate), which is mainly produced by the mitochondria. Axonal transport is vital to ensure communication between the cell body and synapse, so interruption of axonal transport is potentially fatal to the cells. Orthograde axonal transport is mainly in charge of transporting the translated proteins from the cell body to the synapse. Retrograde transport is mainly in charge of transporting neurotrophic factor from the synapse to the cell body  (Fig. 23.2). Mitochondrial dysfunction has been reported to have an important role in RGC death in glaucoma [5, 6]. Changes in the optic nerve head, including disruption in blood flow dynamics and ischemia during glaucomatous damage, might impair mitochondrial function and weaken RGC viability . RGCs have numerous mitochondria in their soma and axons, which reflect their high metabolic activity and energy demand [7, 8]. 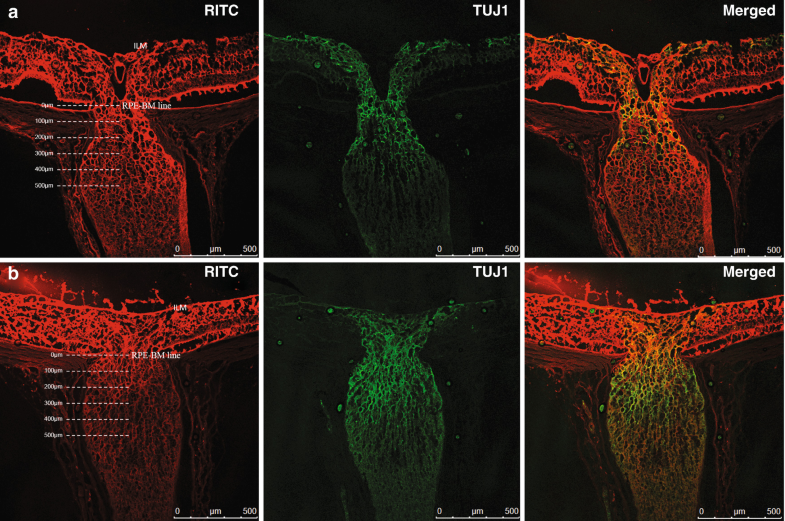 A recent study demonstrated that the ATP content in the mouse optic nerve dropped with age and that the rate of ATP reduction was positive related to increased intraocular pressure in glaucomatous DBA/2 J mice . Another study by Ju found that the optic nerve degeneration that occurs in DBA/2 J mice with elevated IOP includes changes of COX reduction, mitochondrial fission, and abnormal mitochondrial cristae depletion and alterations of OPA1 and Dnm1 expression . These findings suggest that mitochondrial dysfunction contributes to the pressure-related RGC axon degeneration in glaucomatous optic neuropathy. Also, the lack of energy supply due to reduced ATP availability could have a negative impact on RGC function because it disables Na+/K+ ion pumps, which play an important role in transduction of action potentials along RGC axons. Of interest, a mathematic model established by Band revealed that abnormal TLPD can disrupt the diffusion of ATP along the axoplasm and result in the blockage of axonal transport, which finally leads to cell death . Disruption of the axonal transport in the retinal ganglion cell axons impacts the viability of the retinal ganglion cells by reducing the supply of neurotrophic factors. The bottleneck of the orthograde and retrograde axonal transport in the visual afference is the lamina cribrosa of the optic nerve head with its trans-lamina pressure difference (TLPD) between the intraocular compartment (i.e., the IOP) and the subarachnoid compartment behind the lamina cribrosa (i.e., the CSFP). Previous studies have showed that an experimentally elevated IOP can lead to the impediment of both the orthograde and the retrograde axonal transport in animals. By including the CSFP as one of the two determinants of TLPD into the discussion of the pathogenic mechanism of glaucomatous optic neuropathy, we designed our study to inspect whether an abnormally low CSFP is associated with the disturbance of the axonal transport, similar to the situation with an elevated IOP. We injected rhodamine-ß-isothiocyanate (RITC) into the vitreous and examined the distribution of RITC within optic nerve axons to assess the change of the orthograde axonal transport in the low-CSFP rat model. We injected fluorogold into the superior colliculi and examined the retinal fluorogold fluorescence to assess the retrograde axonal transport in the same model. The results of the study showed that fluorogold fluorescence of RITC in the retina was significantly (P < 0.05) lower in the low-CSFP group than in the control group at 24 h after baseline. At 6 h after the fluorogold injection, fluorogold intensity in the retina was significantly lower in the IOP40-group, the PP25-group, and the low-CSFP group than in the control groups, and the attenuation of retinal fluorogold fluorescence in the low-CSFP group was continued to 24 h after fluorogold injection. 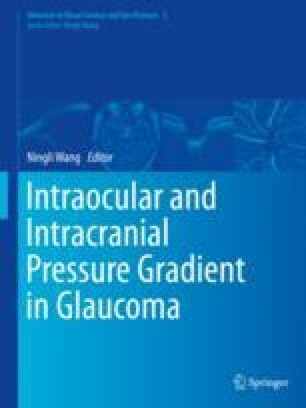 Our experimental study revealed that in both groups either with elevated IOP or with reduced CSFP, the orthograde axonal transport and the retrograde axonal transport in the retinal ganglion cell axons were all retardant, and the impediment of axonal transport may play an important role in the pathogenesis of glaucomatous optic neuropathy . The PNIFF theory proposed by Band explains our findings well. The theory hypothesize that (1) the elevation of TLPD causes fluid to permeate the axon’s membranes, creating a passive neuronal intracellular fluid flux (PNIFF) within the axoplasm. (2) If the PNIFF is strong enough, it interrupts the normal diffusive ATP transport, causing sporadic washout zones in which ATP is depleted. (3) The ATP deficiency leads to short of energy that disrupts axonal transport. The communication between the cell body and the synapse will be disrupted, which could lead to cell death (Figs. 23.3 and 23.4). Our study also found that the RGC axons in both the high-IOP group and the low-CSFP group as compared to the control group became abnormally dilated and accumulated with vesicles. Both high TLPD groups as compared to the control group showed an accumulation of dynein motor protein at the optic nerve head and retina and a reduction of kinesin motor protein in the optic nerve, which also verified that the lamina is a bottleneck for axonal transport during the change of TLPD .